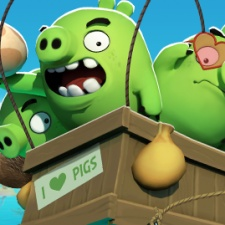 Mobile games developer Rovio has teamed up with virtual reality studio Resolution Games to publish Angry Birds VR: Isle of Pigs for HTC Vive and Oculus Rift. The VR experience sees players put in control of the slingshot, which they can use to catapult the Angry Birds at their pig enemies. The title launches with 50 levels ranging from snowy slopes to exotic beaches. Angry Birds properties have been downloaded four billion times for mobile to date. This release marks the first foray into VR for the Angry Birds property. It’s worth noting that the game was originally created for mixed reality headset Magic Leap One. “As a company we’re deeply interested in the future of gaming and in fact, investigating new tech and platforms remains one of our core strategic pillars,” said Rovio creative director of extended reality Sami Ronkainen. Resolution Games CEO Tommy Palm added: “The beauty of VR is that it allows players to enter and play in a 3D, fictional game universe, something people have fantasised about for decades. And, VR inherently lends itself well to strong characters, which is why the Angry Birds brand is such a great fit with its humor and strong gameplay. In January Resolution Games CEO Tommy Palm was named Mobile Legend at our own Pocket Gamer Mobile Game Awards 2019.